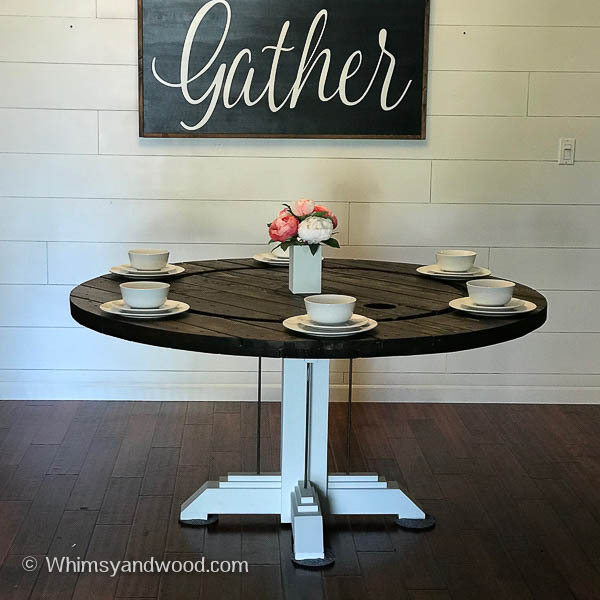 Cable spool dining tables make can make a gorgeous focal point in your industrial or modern farmhouse decor. This post contains affiliate links. Purchases made from these links help support our blog. Thank you for your support! Do you love Industrial and Farmhouse style design? ME TOO! Farmhouse design bridges easily into using industrial finishes around the house. A mix of wood, metal, & brick, softened with natural patinas, soft knits, wild florals, and colorful succulents. 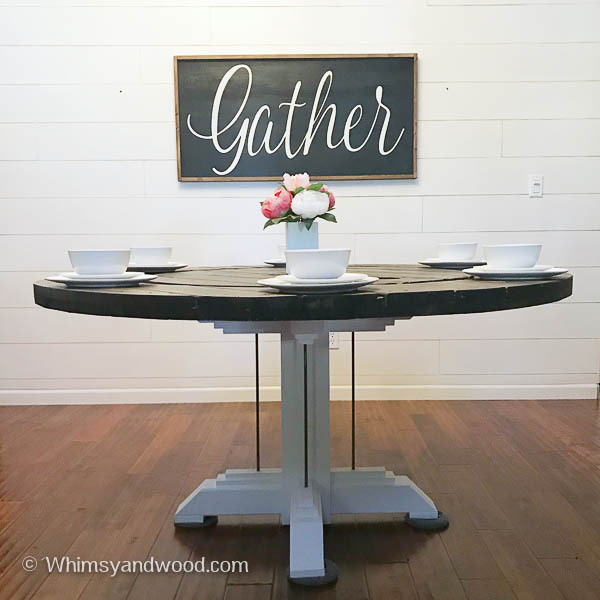 Our Cable Spool dining table is a perfect touch for this trend. I am fortunate enough to have a couple of connections for large industrial cable spools. In your area you may be able to find them by contacting local builders and electricians that work on large developments like new home housing tracts and power companies. Start on Craigslist, I have had good luck on CL. I am a figure it out as I go builder. I start with an idea and a very basic sketch and then tweak to get the look I want as I go. I am a little envious of anyone that can sketch up a design and be able to see the full final project in their mind. I would explain my process as a feeling for the finish and then I chip away at it. You can see some other Cable Spool Project designs here. 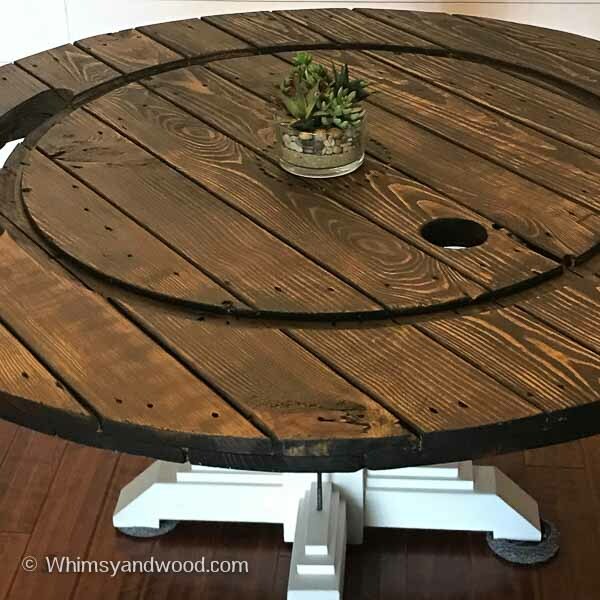 Cable Spool Patio Table with Keg, Cable Spool coffee table. Take your cable spool top or bottom and follow these instructions to cut it down to the size you want. You can either build a table base or find pedestal table base for sale. Here are a few I really liked. I built this base & decided to incorporate the metal bars that used to hold the original spool together. I cut the bars down to size using my angle grinder and a cut wheel. 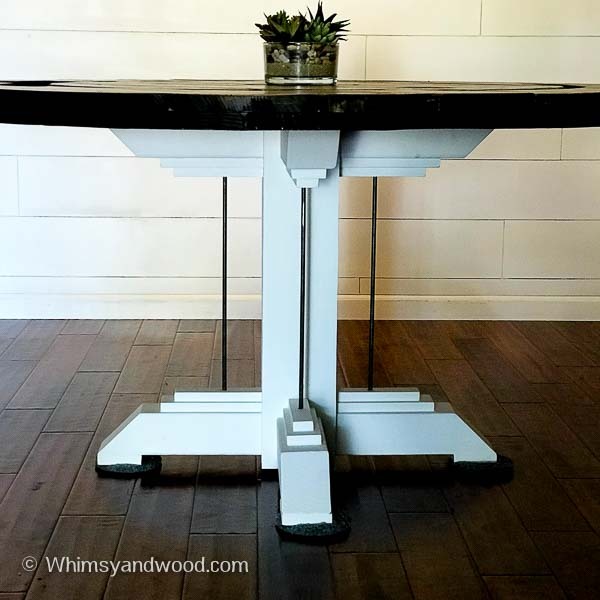 The table base was painted using Pure Home Paints White Linen & used a clear matte top coat. I did use a penetrating stain from MinWax in the color Ebony. Penetrating stains create such a beautiful contrast. I think it makes pine have an exotic look. Then top coat with an appropriate sealer. I used Zar Antique Flat. Use screws the correct size for your materials. Drive a screw from the table arms up into your table top. Would you use a cable spool in your design? 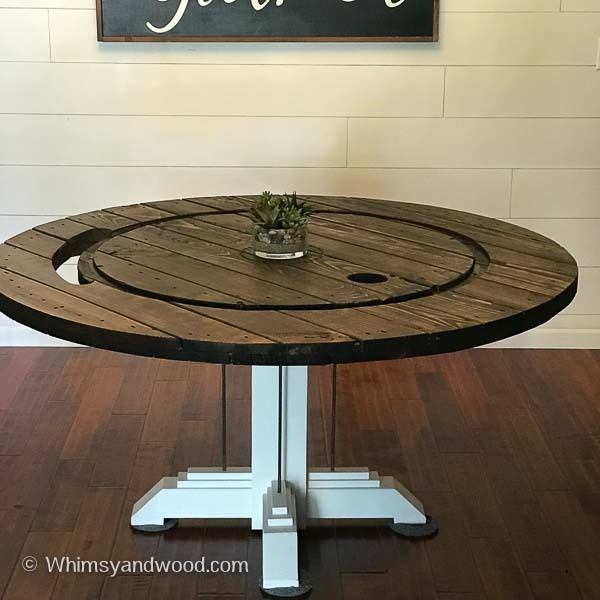 Did you check out our other cable spool projects? What do you think about industrial design? 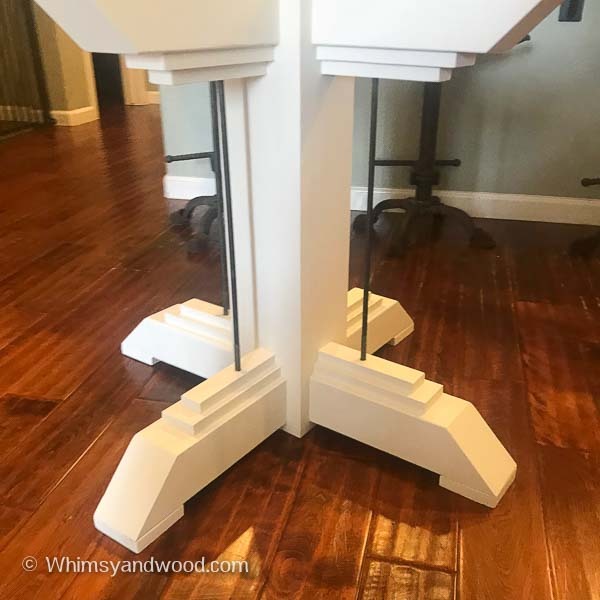 We do build custom furniture to order click here to see some of our builds or email us at info@whimsyandwood.com to learn more. We also loved these chair, lighting, and decor pieces! Did you know we do custom art? I would love to create a custom piece to complement your industrial decor! Thanks for visiting and I would love to hear your thoughts in the comments below.